Includes a nearly accurate depiction of the Blue Nile! Nubie et Abissinie Projettée et assujettie aux observations Astronomiques. 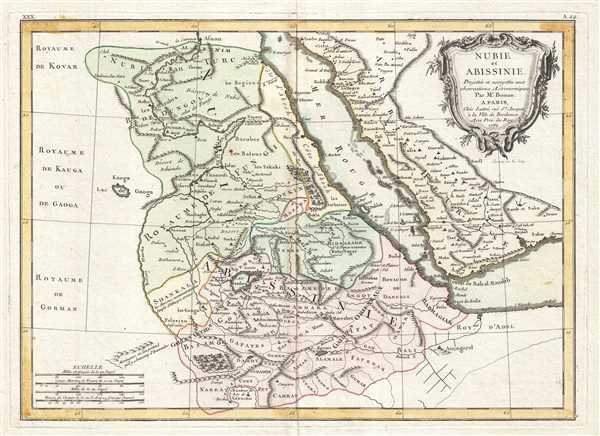 This is a 1771 Rigobert Bonne map of Nubia and Abyssinia. The map depicts from Aswan, Egypt to modern-day Ethiopia and from modern-day Sudan to Saudi Arabia. The modern-day countries of Eretria, Djibouti and Somalia are illustrated and border the Red Sea, which is labeled. This is a fairly advanced map revealing the cartographic sophistication of the Abyssinian Empire. The Blue Nile is illustrated flowing correctly into Lake Dambea (Lake Tana) from the south. Numerous important cataracts on the Blue Nile are labeled. The White Nile, whose course is more mysterious, acts as a kind of western border for this map, with only vague notations regarding the African empires lying on its western shores. Numerous Nubian and Abyssinian cities and monasteries are labeled, along with Mecca across the Red Sea. A decorative title cartouche is situated in the upper right corner. Drawn by Rigobert Bonne in 1771 for issue in Jean Lattre's Atlas Moderne. Lattre, Jean, Atlas Moderne ou Collection de Cartes sur Toutes les Parties du Globe Terrestre, c. 1775. Rumsey 2612.063. Phillips (Atlases) 664. National Maritime Museum, 215.